I'm shooting downtown today. The photographer is Martin Kunert. Martin and I've shot a few times together. One, a really nice studio shoot that involved sheets of brushed aluminum. The other was a shoot in New York that I didn't attend. Martin decided it was a good idea to shoot on the streets of New York—the same day that Hurricane Sandy was scheduled to pour through. His reason? Nobody would be on the street. Well, he was right. By the time he was shooting, everyone was either safe at home or swept away down some drainpipe. Lucky for him, the model didn't blow away in the storm. Well, actually, that might have made a really cool YouTube video. Can you picture it? There's a good reason there's not a soul in sight. Because this was the day that Hurricane Sandy came roaring through New York. How Martin convinced the model and entire crew to make their way downtown is anyone's guess. Martin Kunert's first editorial shoot for Genlux. Come to think of it, it may have been his first fashion editorial shoot, ever. I love shooting with new people all the time. Genlux is a platform for helping launch creative careers. Today we're shooting again in his downtown loft space. I love the energy of coming down here. Of getting in the freight elevator and not knowing how to use it. Of not closing the gate properly and having people yell at me from three stories down. Wait, what was it I loved about downtown? Oh, yeah, the energy. I love the creative energy of downtown. As soon as I walk into the studio, I LOVE what Martin has created. He's draped the entire studio in plastic—from ceiling to floor. These huge, loose sheets of thin plastic that softly veil everything they cover in a glowing light. The plastic is just opaque enough to hide what's behind it—but just translucent enough to create a glow when lit. I love the spontaneous nature of the set. If you want to create images that have life to them, interject elements that live through kinetic energy. You know, things like wind, water, rain, fire, clouds, soft fabrics, falling or thrown objects, etc. Our model is Maggi from Vision Models. She's tall, almost 5' 11" and has a great face. There's just one thing about her that I'd like to change, but we can do that in post. (No! I'm not going to tell you)! Here is our stunning model for the day! Maggi from Vision Models. We haven't used Vision for a while but they have some really great girls. We have a British Dandy fashion theme for today's shoot. So the inspiration is super colorful, busy and masculine. Lots of prints and patterns. Our stylist for this challenge is Lisa Cera. Lisa is very much a New Yorker, but she gets the 60s British concept. Fitting, since this is going in our special BritWeek issue. On set today are some of my favorite glam squad peeps. Helen Robertson from Celestine is on makeup; and Robert Steinken from CloutierRemix, who seems to be doing all of our shoots lately, is on hair. When I got the call sheet yesterday, Martin had another makeup artist listed that I'm not so fond of (shame on Martin for not consulting me first)—so I contacted the agency and made the ol' switcheroo. When finessing through the preciousness of the creative process, it's best to work with the people you click with. Maggi from Vision on our shoot today. Hey wait, I just noticed that squiggly mark on her finger. Has the sensor on my iPhone bit the dust? Look, it's also on the photo below. But it's moving... aaaghhh!!! Martin Kunert behind the plastic. Hi Martin. Wave to the viewers...Oh, you are? Our super stylist Lisa Cera. She works hard and is always expressing how grateful she is to Genlux for helping her make contacts in LA. 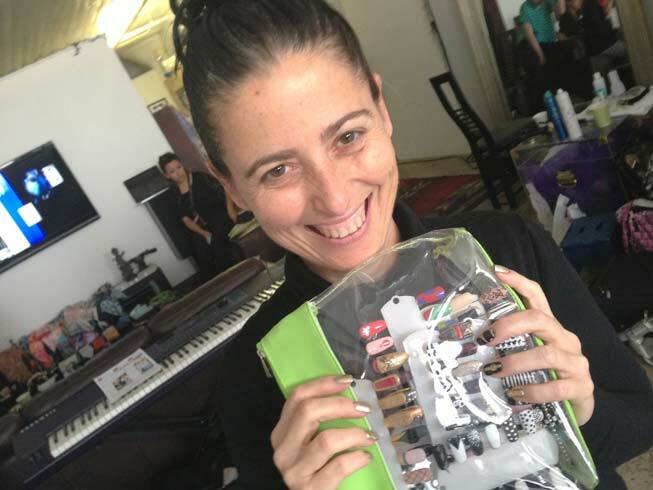 Here is Denise Bourne the manicurist who also happens to be Lisa Cera's sister. It's a two-fer. I'm happy we had Helen Robertson from Celestine on set today. She's awesome!! Robert Steinken is doing hair today. I'm really kind of getting sick of seeing him. He also does the hair for Robin Thicke and Paula Patton. Nope, he wouldn't give up any info. His lips were superglued shut. Robert did give me Paula's publicist info to see if we could shoot her. We love Robert! Today I'm also editing the Lydia Hearst cover shoot. We have so many great shots. Too many great shots. I'll share some tomorrow. Maybe I'll get your vote on the final selection?